Liverpool Plains grower David McGavin in his 390-hectare paddock of sorghum. It contains two varieties sown simultaneously with a multi-hybrid planter using data from the soil map displayed on his iPad. 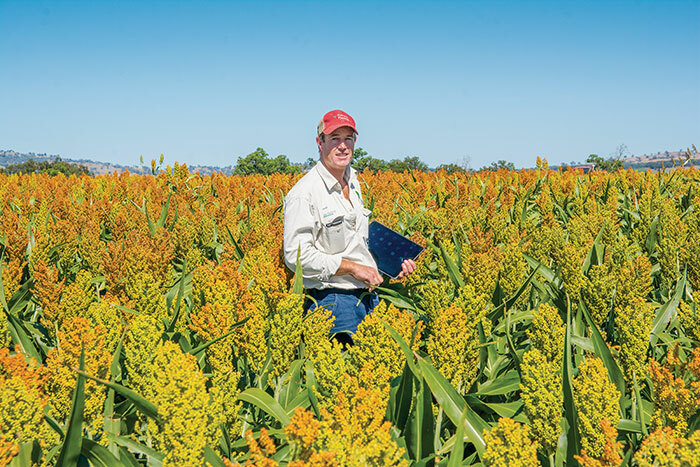 A multi-hybrid planter, a paddock map that plots soil conductivity and software that links them have been combined for the first time to give Liverpool Plains grower David McGavin two sorghum crops in one. The planter simultaneously sows two different varieties as it moves over changing soils. This season David sowed a blend of high-yielding MR-Scorpio (44 per cent) and MR-Taurus (56 per cent) – a mix designed to improve the 390-hectare paddock’s yield by five per cent over planting a single variety. “The MR-Scorpio has gone into the heavier soils and the MR-Taurus into the lighter country, with the soil map determining what was planted where,” he says. The planter differs from conventional row crop planters by having twin mini-hoppers that feed two separate, side-by-side meters. These switch back and forth as the unit travels over different soil types, planting the hybrid that best suits that soil. Both vSet Select meters share a common seed tube and switch simultaneously to leave no gap in the field. David says setting up the 16-row planter cost about $1000 per row more than the cost of using a single-hopper planter, but a three per cent yield increase will cover that. Set up on 50-centimetre spacings, the unit was used for the first time on the McGavin family’s Premer property to plant sorghum in mid-October. David says his decision to invest in the multi-hybrid planter was prompted by the variation in yields caused by soil types with different water-holding capacities and by the inability of widely used vacuum planters to reliably place one seed at a time at the required spacing. An uneven sunflower crop grown in recent years drove home the shortfalls in existing planter technology and convinced David that change was needed. “The sunflower seed was smaller than usual and the seeding rate in 30 per cent of the paddock was wrong because the plate in the single-disc planter had either grabbed two seeds or skipped one,” he says. The paddock sown with the new dual set-up includes three 27-metre-wide test strips – one of MR-Taurus, one of MR-Scorpio and one with a combination of the two on either side. Their yields will be used to provide comparative data.